Harvey Goldsmith is proud to announce OnRoundhay Festival in partnership with John Lewis, a brand new family, music and food festival in Leeds. Taking place in the stunning surroundings of Roundhay Park on 17 September 2016. OnRoundhay is the ultimate day out for standout live music with mouth-watering food and drink experiences along with a fun-filled program of entertainment for all ages, where under 12s go free! Confirmed for the inaugural festival is a fantastic line-up of amazing artists including the multiplatinum-selling James, fresh from their triumphant set at Glastonbury. Their new album Girl at the End of the World surged to number two in the album charts earlier this year. The Sit Down and She's A Star group will co-headline alongside Scottish rock legends Primal Scream, who've had another incredibly successful year with the release of their new Top 20 album Chaosmosis and a string of critically acclaimed live performances. 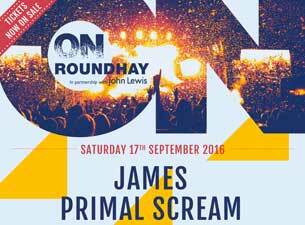 OnRoundhay is the new sister festival to London’s On Blackheath.